BikePT staff member and Master’s World Champion Kari Studley filed this travel and race report of her experience in China’s Qiansen Trophy Cup. Racing internationally and visiting China have been on my bucket list of life goals, so getting to be a part of this race was multiple dreams come true. 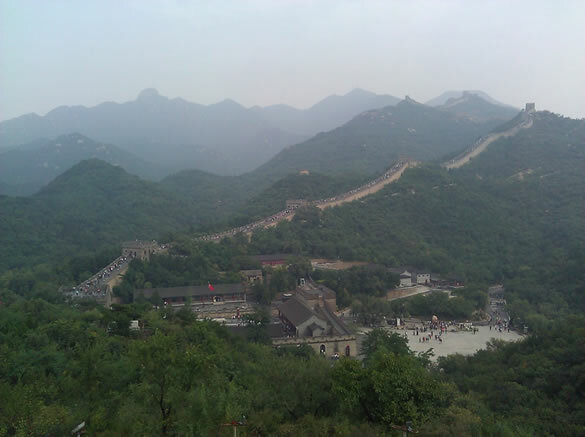 The race and host resort were in Yanqing Beijing – 90 minutes North of Beijing and 15 minutes South of the Badaling section of the Great Wall. The scenery was very reminiscent of Seattle with mountain views peeking over the city and green landscapes once the morning clouds disappeared. The timing also happened to be during the “full moon” and fall harvest festival, which meant a wide selection of Moon cakes at every meal and clean air city conditions as a big part of the festival is returning home to celebrate with family. The morning clouds burned off to reveal the panoramic views and the humbling magnificence of the Great Wall. What I enjoyed most about this race was that no one was at a significant advantage. 86 riders from 18 countries and 22 teams came together to share and celebrate cyclocross with China. The Belgium and European riders got to fully appreciate the challenges that come with traveling by plane to race (and without the comforts of the team RV), the majority of racers traveled over 10 hours and had adjust to a radical time zone different and minimizing jet lag in a similar timeframe, and 83 of us did not speak or read Mandarin or primarily eat a Chinese-food inspired diet. So, we were all in the same boat of adapting to the challenges that come with traveling in addition to bike racing. 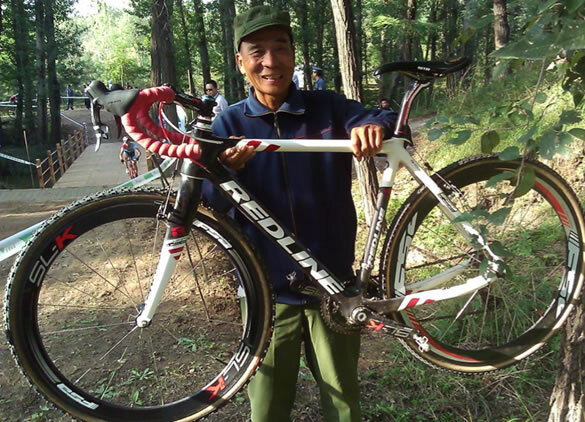 I will confess that Team Redline did have a slight advantage as our race support, Paul Gissing, is a native Seattle Team Double Check cross racer currently living in Beijing – and fluent in Mandarin. 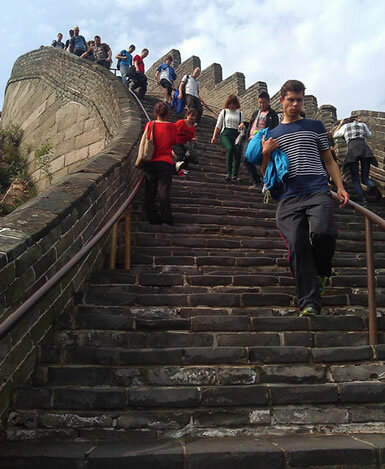 On our first morning, we were treated to a tour to the Great Wall and I was really glad I had decided the week before to go hiking on the record-setting sunny days instead of cycling as there was no flat section on the Badaling portion of the Great Wall. It was steep going up and down, and the physical therapist part of me was intrigued people watching all of the footwear choices – from high heels, flip flops and slippers – also scaling the challenging steps and slopes. Bless our kind tour volunteers who I doubt are used to regular exercise and hiking (my group volunteer told me it was her “second hike ever”) and, more unfortunately for them, trying to keep pace with a group of elite level athletes with twitchy post-flight legs walking the Great Wall. 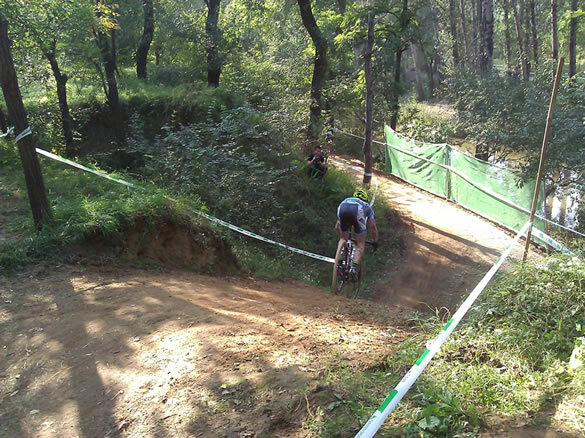 Steeper than it looks, especially going down! The course was a fun mix of fast flat straightaways on a paver bike bike path paralleling a stream, technical descents and ascents on the streamside slopes, two steep hillside stair sets that made me thankful for my long legs and the Great Wall hiking warm up, three river crossings over newly constructed bridges, and a FUN stair run-up fly-over that flowed into a mini-pump track style bumpy section that weaved around forest trees. 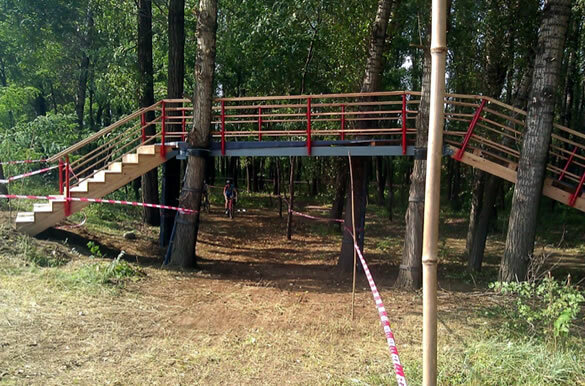 The technical and bumpy sections on the course were deceivingly physically demanding. Thanks to the early Seattle season races, I was experienced in dry, bumpy courses like this and at an advantage from talking to other racers from around the world who commented that these course conditions were a new challenge to them. Molly Cameron riding down the hill the sign is referencing… It was the steepest one on the course and made an immediate L-hand turn to ride up the hill. Glad I did some work on my technical downhill transition skills in August with Simon Lawton of Fluidride! I also enjoyed watching the course and venue transform each day and experience the big race production final touches – like course warning signs and jumbo screens – on race day. 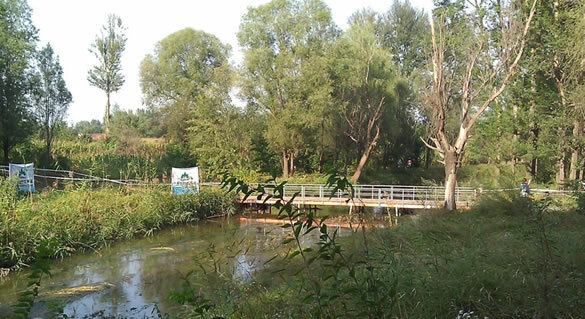 I couldn’t have asked for more perfect weather and conditions –clear, blue skies, 22deg Celsius and a cool breeze under the trees along the stream. Despite not having any UCI points (since I pursued Masters Worlds last year which means you can’t have UCI points to be eligible in the UCI Masters category), I still got a second row call up with lucky race number 13. 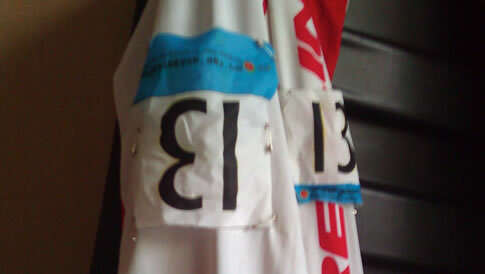 I caused quite a commotion when I rode through call up with the traditional #13 pinning (upside down) as proper back number placement was a big deal for the dedicated Chinese race volunteers (and most people had their back number re-pinned several times). 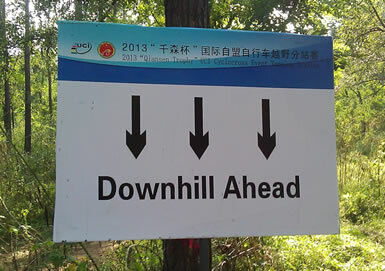 Luckily, I had forewarned the UCI officials that I would be, so I listened with amusement as they told the volunteers it was okay. I had a reasonable start and basically maintained my position, gaining a place for every place I lost in the first half lap shuffle and was able to stay ahead of and ride around the crashes on the descents. Once the race had strung out, I settled into a moderate pace, trying to balance speed, exertion and utilizing the course features as riding flow energy instead of physically absorbing the bone-chattering bumpy sections. On lap three, I could tell that my conservative strategy was paying off as I felt relatively good while the ladies around me were showing signs of being worn down and almost ricocheting off their bikes on the bumpy sections. I was slowly gaining on riders fatiguing from the fast start and fast pace the course allows. Getting the final lap bell (there was no lap board, so I didn’t know whether it would be a 4 or 5 lap race) going into the fourth lap, I ramped up my pace while pushing the technical sections to my limit to work up from 10th to 6th place. Essentially, my race can be summarized as a good race and a great last lap that put me as the top placed USA woman! It was an absolute honor to be a part of this unique historic moment in cyclocross and Chinese history. I cannot thank enough Qiansan Sports, race promoter Yan xing Song, the amazing hospitality from Beijing Jinyu Badaling Spa resort, the generous time and tireless energy of local Chinese volunteers and Team Redline for helping make this event possible and such a huge success! 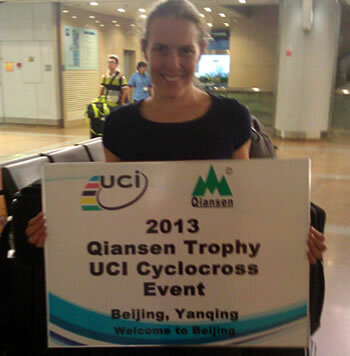 I look forward to renewing my Visa to race in China again next year! I enjoyed the special touch of course signs. The course crossed this stream three times and used both sides of the stream bank. Making friends with local spectators – I wondered if I would get my bike back! This man made sure everyone around us got to experience just how light the Redline Conquest Team cross bike is. Thanks to all of the hard work of event staff and UCI to make this such a success!